In freshman year I remember being aghast at some of the exam questions my dorm-mates got in their engineering physics classes. They typically had some hideous problem that involved a block on an inclined plane, attached to a pulley, which was attached to some other random item involving another inclined plane and a spring. The question then asked to calculate the net force on the block. The exam questions didn’t ask the students to solve each type of problem (pulley, spring, inclined plane etc) individually. The time for that was past. The point of those exam questions was to see how students could apply all of the individual skills they had learned over the course and put them together into a whole. It tested the ability to think. 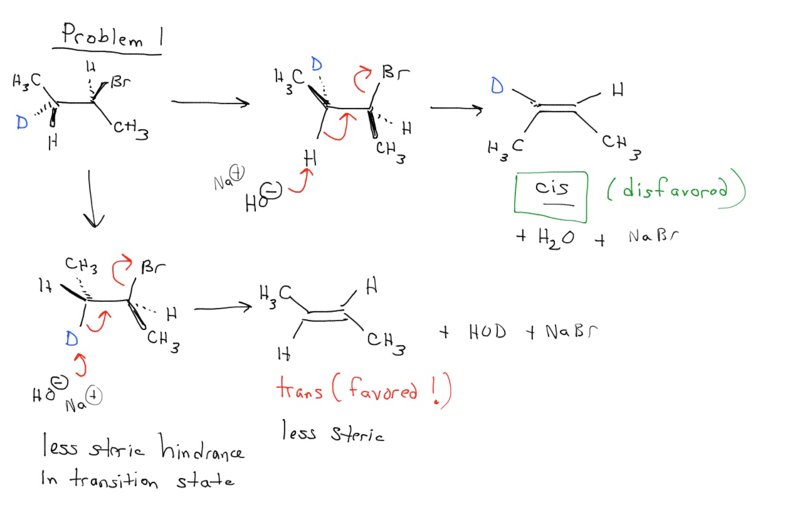 Your experience may vary, but many written exam questions in organic chemistry (i.e. the longer questions, not the multiple choice) won’t just test you on one thing, but will ask you to apply two or more different concepts and put them together. If you go back to my earlier chess analogy, a good problem is a bit like a “fork” – it brings together two seemingly unrelated ideas. 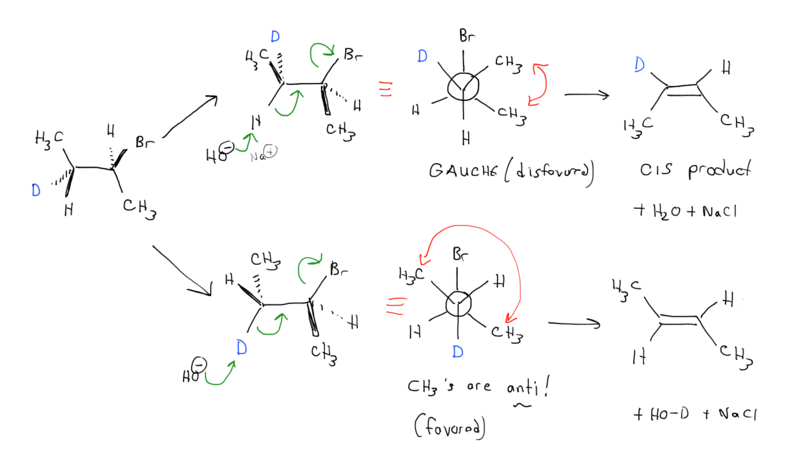 This is part of the reason why organic chemistry (like chess) is hard. Here are two problems I like that contain concepts that are known by maybe 50-60% of the way through a typical Org I course (depending on the course, of course). The first problem I like because it involves an application of concepts learned in two individual chapters in your textbook. Treating A with base, you obtain B and not C. Justify why. [FYI – the D stands for deuterium, which is a heavy isomer of hydrogen. It’s just there to provide a label – you can assume it has the same reactivity as hydrogen.] Edit – Fixed! The second problem also involves the application of two different concepts that are covered in different parts of the course. Cations are involved. These aren’t trick questions by the way. They’re actually quite straightforward. They’re just meant to demonstrate how simple concepts can combine in interesting and unexpected ways. It’s part of what makes organic chemistry so deep, rich, and challenging. 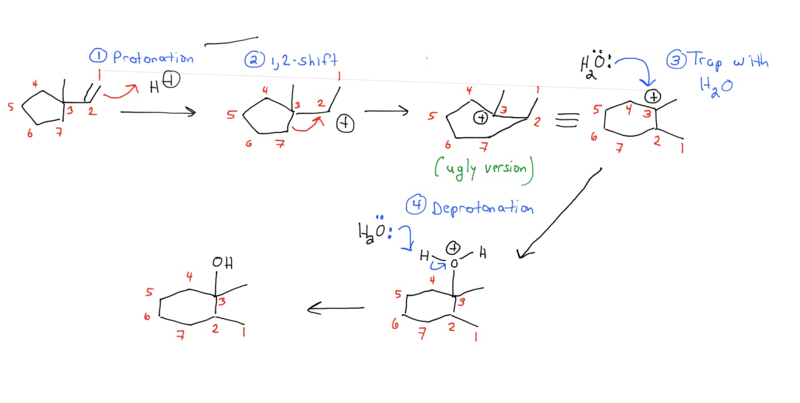 -your study partner deprotonated an alkyne in the presence of an alcohol (in the same molecule – this one was pictorial). -your study partner has provided the following incorrect IUPAC names of alkanes. What are the structures and correct IUPAC names? That’s clever – it helps make the question less abstract, more situational – provides a reason “why” to solve the problem. Plus it plays on people’s natural enjoyment in proving other people wrong. Nobody seems to talk about these psychological side-issues in asking exam questions but I bet there’s a lot to explore there. Thanks for sharing. Did the ring expansion in problem 2 take place just because it was getting converted into a six membered ring or are there more reasons?